In celebration of our 30th anniversary, CoroAllegro, the Delaware Choral Society and singing friends from the surrounding area, will present a one-night-only concert event at the beautiful baby grand in Wilmington, DE. 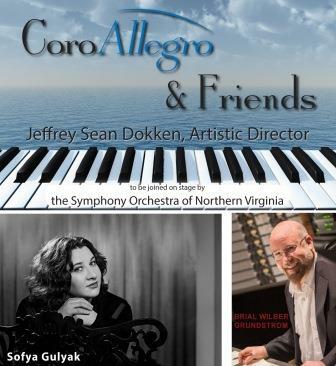 The choir will be joined by the Symphony Orchestra of Northern Virginia and world-renowned piano soloist Sofya Gulyak. The concert will feature Beethoven's masterful Choral Fantasy and the world premiere of a CoroAllegro commission, "Children of Zeus" by American composer Brian Wilbur Grundstrom. The combined forces of the choir, orchestra, and piano, along with a marvelous commission make this a concert not to be missed.